[無料] AdBlock Master:Block Popup Ads | Mac App Storeのアプリ検索・ランキング BuzzMac! A lot of people ask How can I block ads on Safari & Google Chrome? How can I remove ads from Firefox? How do I get adblock? Adblock Master is designed for this. 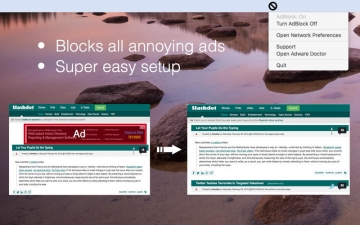 After using AdBlock Master, you can surf the web without annoying ads. Blocks YouTube, Facebook and ads everywhere on the web.